Motorcycles are, by nature, a do-it-yourselfer's dream. When it comes to customization or restoration, any wrencher with a small garage and a few basic tools has been able to take care of most tasks... except painting. To restore a motorcycle's original paint color or give it a unique look of its own can often be one of the most frustrating and time-consuming projects. And to send parts out to be professionally painted can cost thousands of dollars. 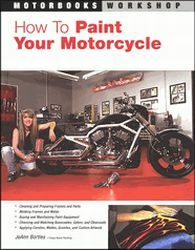 In How to Paint Your Motorcycle, author JoAnn Bortles teaches the art of motorcycle painting from top to bottom, from matte black to candy coats, metallics, marbilizing, granites, and more. Bortles explains bodywork and molding techniques, setting up your paint area, buying and maintaining your equipment, and choosing the correct paints and finishes. Whether you're looking to paint your own bike, your friend's bike, or simply want to know more about bodywork, airbrushing, and custom painting, How to Paint Your Motorcycle is the perfect volume to get you started.